Have you ever wondered what campaigning is, what is involved and whether it can actually change anything? If so, our Head of Policy & Campaigns, Asha Kaur, explains it all in our latest blog post. Read on to find out more. Campaigning is about making real change happen on issues that matter. It isn’t just about waving placards and going on marches. There are lots of different ways to campaign and make a difference. If you’ve ever signed a petition, wrote to your MP or even tweeted about a cause you care about - that’s campaigning! Why do we need to campaign? Campaigning not only lets the public know about issues that are important to us, but it can also motivate them to speak out and join us in leading change. This is important because the more people that get involved and act, the more chance we have to create lasting change. When we think about healthcare, campaigning isn’t always the first thing we think of. But it doesn’t take long to realise that decisions made about our healthcare system has life changing consequences – and that’s why we campaign for what’s important. Improving the identification and management of people with Lynch syndrome, through our “Time to Test” campaign. With around 16,000 people dying from bowel cancer each year – making it the UK’s second biggest cancer killer – we’re determined to save lives and improve the quality of life for all those affected by the disease. But we can’t do it alone. 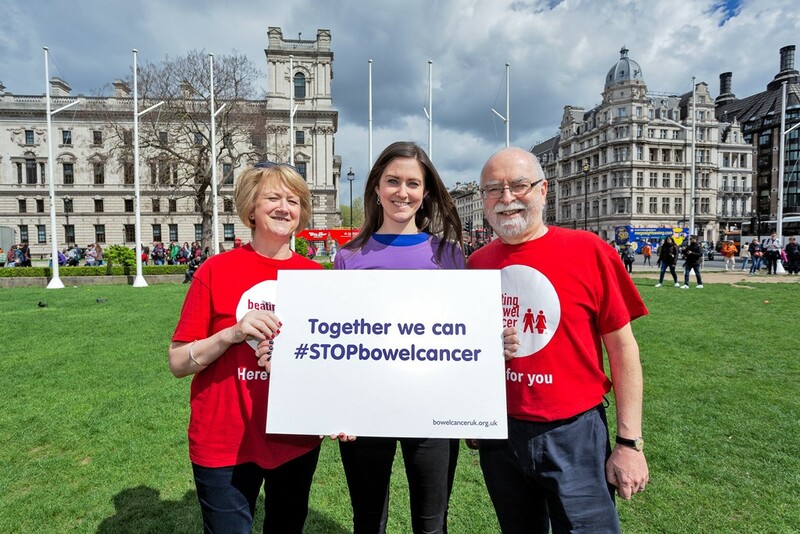 Our campaigners are crucial to achieving our ambition of transforming survival rates for bowel cancer. They help us to show that our campaigns represent issues that are important to the wider public. This support helps us put pressure on decision-makers and makes it more possible to achieve change. That will often start with something simple like signing a petition and applying more pressure as time goes on. Secure a parliamentary debate in Westminster on bowel cancer screening with the support of one of our Bowel Cancer Champion, Nick Thomas Symonds MP, and a National Assembly debate in Wales to shed light on key issues facing bowel cancer in Wales. Put pressure on the Department of Health and Social Care to ensure the new and improved screening test known as FIT is rolled out effectively from 2018. Put pressure on local health bodies across the UK to ensure all bowel cancer patients are tested for the genetic condition, Lynch syndrome. Find out how you can take action on our campaigns here. Our supporters have been central to telling the story of why these improvements are crucial to saving more lives from bowel cancer. This has included sharing our stories in the media, speaking to MPs, writing to local papers, writing to Ministers, tweeting and many more. Although you may not always see it – when we’re all pulling in the same direction it really makes a difference. We couldn’t do it without you.